What is the difference between the lead acid battery and the AZ lithium ion battery? The lead acid battery is mainly formed by the acid and the dilute sulfuric acid, and the energy density is low. The AZ lithium ion battery is made by the lithium iron phosphate positive-electrode active material, and the battery does not contain hazardous and toxic substance such as mercury and sulfuric acid in the lead acid battery. Compared with the lead acid battery, the energy density of lithium ion battery is three times as large, and it is extremely light and the battery that has very low self-discharge rate. What is the difference between the AZ lithium ion battery and other lithium ion batteries? Compared with lithium ion batteries for power supply such as cellphones and electric cars, the AZ lithium ion battery is made by different materials firstly.  Although the capacity (C10) is lower than the lead acid battery, why is the crank performance (engine starting performance) of the AZ lithium ion battery is high? The AZ lithium ion battery has three times higher energy density than the lead acid battery because of use of the lithium iron phosphate positive-electrode active material. As a result, even though the capacity is lower than the lead acid battery’s, the crank performance (engine starting performance) is high. Is it possible to use battery chargers for exclusive use of lead acid batteries for AZ lithium ion battery? It is possible to use, however, please do not charge the AZ lithium ion battery by chargers that do not have charging voltage control, and the charging voltage is more than 14.8V. please also do not use chargers that have automatic de-sulfation function (recovery charge function). We recommend our product, “AZ BATTERY CHARGER ACH-200,” if you charge and maintain batteries. Of course, the charger can be used for lithium ion batteries, too. How can I check the remaining capacity of the AZ lithium ion battery? You can measure the voltage by a battery tester, and then you can calculate it. *Do not discharge the battery lower than 12.86V. Please tell me how to dispose of used AZ lithium ion batteries. Please bring it back to the shop that you purchased. Is it possible to place the AZ lithium ion battery on any position such as upside-down position? Yes, it is possible to place the AZ lithium ion battery on any direction because it is sealed completely. How long the life cycle of the AZ lithium ion battery is? The average of life cycle of lead acid batteries is about three years. On the other hand, the life cycle of the AZ lithium ion batteries is 1.5-2 times as longer as the lead acid batteries. Can I use the AZ lithium ion battery for other purposes except motorcycles? You are not allowed to use the AZ lithium ion battery for other purposes because it is for motorcycle use only. If you use it for other purposes, it is not qualified as being warrantable. How can I place the AZ lithium ion battery in a motorcycle if the size is smaller than a lead acid battery that has been placed before? Please adjust the size to fit the AZ lithium ion battery in the battery box by spacers in the package. What is the cause of the lithium ion degradation? What does the degradation accelerate by? The lithium ion degradation is caused by use under the overcharge condition and high temperature because they promote a stronger chemical reaction in the inside of battery. The over discharge also promotes the degradation. The regular maintenance helps batteries to have a longer life cycle. You can install AZ lithium-ion battery if the charging voltage is from 13.5V to 14.8V. 2. Keep RPM over 2,000, then check the voltage. The voltage should be between 13.5V to 14.8V. 1. Remove the battery from motorcycle and store it in your home or remove the negative cable of the motorcycle from the battery. 2. Maintenance by lithium charger which should be satisfied the specification of charger as above.